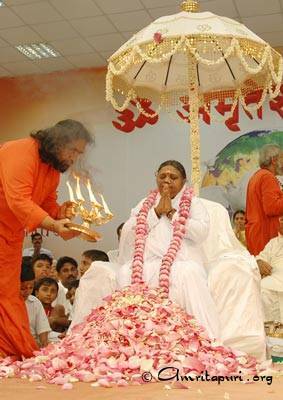 AMMA’s Birthday was celebrated on 27-9-05 with simple ceremonies in Colombo and in Kalutara (in western Province of Sri Lanka), where the Ashram is building houses to resettle the families displaced by the tsunami. 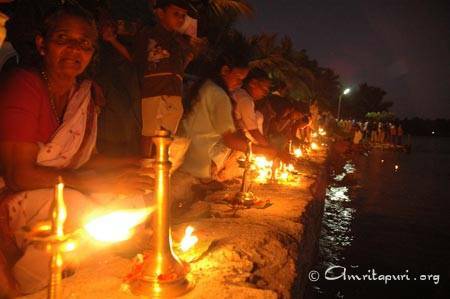 This was the first time Amma’s birthday was being celebrated in Sri Lanka. 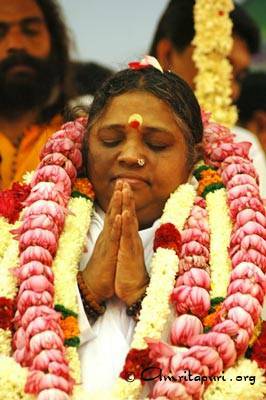 On 27th September, the birthday of Sri Mata Amritanandamayi Devi, Sri. 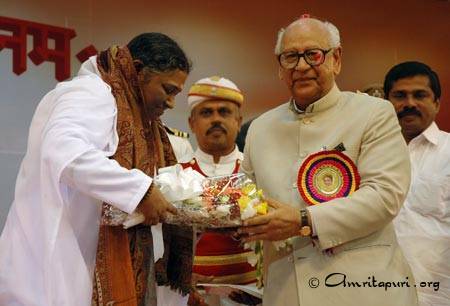 P. Narayana Kurup was awarded the Amrita Keerti Puraskar for his meritorious contributions to spiritual and philosophical literature. Kurup is an award-winning poet and literary critic and is a recipient of numerous awards, including the Ollur Award. His Excellency the Governor of Kerala, Sri. R.L. Bhatia, handed over the award, which consists of a cash prize of Rs. 123,456, a handcrafted idol Saraswati Devi and a Certificate of Commendation from the Mata Amritanandamayi Math. The cash prize rendered through this award is intended to support the recipients, helping them to be financially in the position to continue to dedicate their life to their noble pursuits, and thereby foster the cultural heritage of India. Many people stay up late the night before their birthday so they can be awake when the clock strikes midnight. 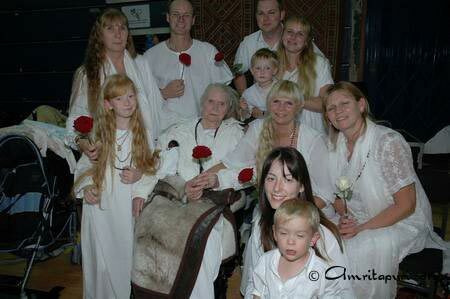 Amma also got the celebration started just past the midnight hour, but of course not for her, but for her children. Just before the clock struck 12, Amma descended from her room to pay a surprise visit to the kitchen. 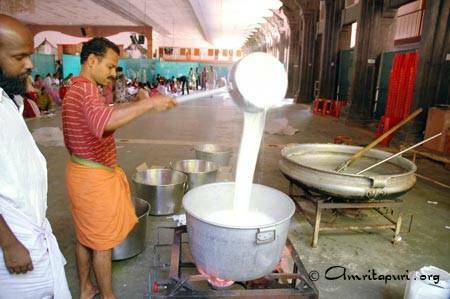 The kitchen was buzzing with activity as teams of devotees prepared lunch for the massive crowds that will be in attendance for tomorrow’s celebrations. Amma walked slowly through the kitchen, speaking with the devotees doing seva there, asking them how the work was going. She walked past several pots that could have easily passed for small swimming pools. She checked all the storerooms. Then she went upstairs where a large group of devotees was chopping vegetables. 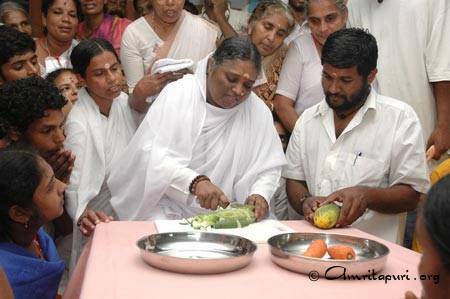 Amma took a seat among them and began to chop some vegetables herself. First a cucumber, then a carrot, then some beans while everyone enthusiastically chanted the mantra Om amriteshwaryai namah. 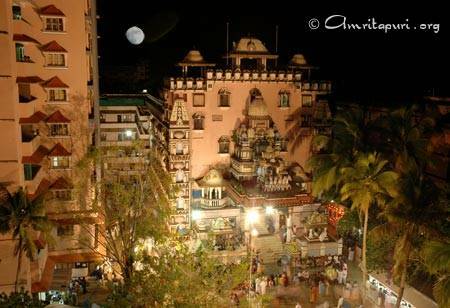 Amma then sat to scrape a coconut and momentarily disappeared in a swarm of devotees who were overcome with devotion. Eventually Amma made it back down to ground floor and paid a visit to the bakery. There, she took great delight in kneading and rolling the dough, taking time to make sure that all lumps and rough spots had been worked out. And just before Amma went back to her room, she made one last stop, this time by the chapatti rollers. 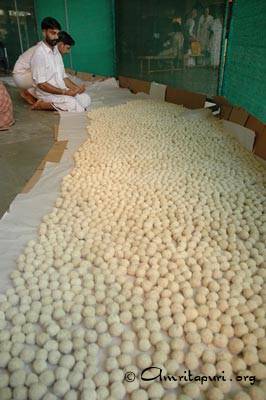 As they sang “Amma Amma Taye,” Amma sat amongst them and rolled the dough flat. By the time Amma returned to her room, the celebrations were well underway. 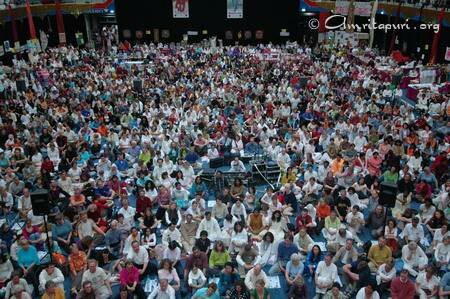 Some 200,000 people descended on Amritapuri for Amma’s birthday this year. The seemingly gigantic bhajan hall was deemed too small a venue, and a special pandal was therefore erected behind the hall, with a capacity to seat nearly 50,000 people. 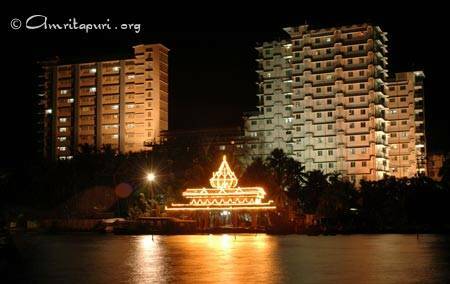 But in the early hours of the morning, when Ganapati Homa was performed by Surya Kaladi Jaisuryan Bhattitiripad, that pandal was already nearly full. 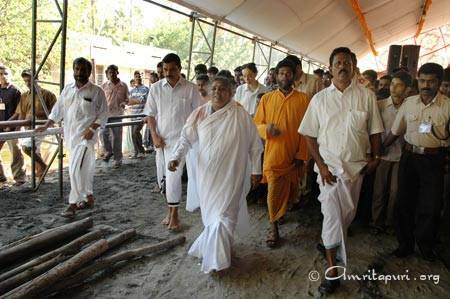 At 8:45 a.m. Amma walked to the dais. 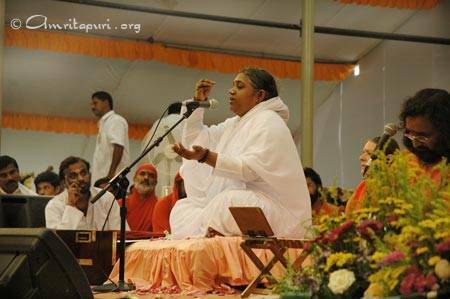 She offered her prostrations to everyone assembled, and then Swami Amritaswarupananda performed the traditional padapuja. He was assisted by Swamini Krishnamrita Prana. When the padapuja was complete, the senior swamis all garlanded Amma, as she sat in meditation, with hands folded in pranam. The foundation for Amma’s birthday address was a solemn one, as Amma immediately began recalling all the tragedies of the past year: the tsunami, the floods in Mumbai, the recent hurricanes in America, the various terrorist attacks that have taken place. 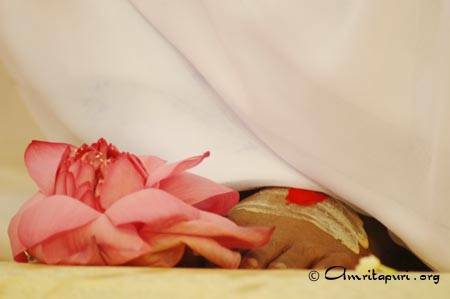 Amma said that when she thinks back on all these events she feels that the whole world has fallen into the grip of an octopus of fear. The Vice Chairman of the Math, Swami Amritaswarupananda Puri, officially welcomed the gathering, which included His Excellency Sri. R.L. Bhatia, the Governor of Kerala; Sri. Prakash Jaiswal, the Honourable Minister of State for Home Affairs, Smt. K.R. Gowri Amma, the Honourable Minister of Agriculture for the Government of Kerala; Sri. Babu Divakaran, the Honourable Minister of Labour for the Government of Kerala; Sri. 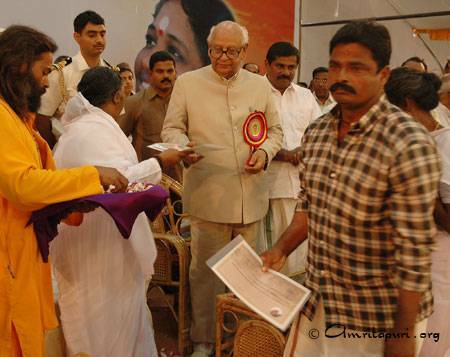 Jagadambika Pal, former Chief Minister of Uttar Pradesh; Sri. Tukaram R. Patil, Member of Parliament – Maharashtra; Sri. P. Narayana Kurup, esteemed poet and literary critic. On behalf of the Ashram, His Excellency the Governor symbolically handed over keys for 550 homes to tsunami-affected people in Kerala. Speaking on the occasion, His Excellency said, “In the coming years, India will be known not for its population of 100 crores or its nuclear power, but for the far-reaching humanitarian activities of Mata Amritanandamayi.” He commended the excellent work done by the Ashram. 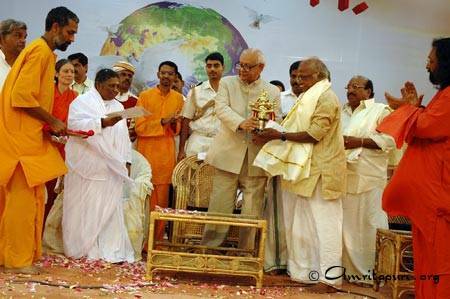 His Excellency also presented the Ashram’s Amritakeerti Puraskar to poet and literary critic P. Narayana Kurup. The award carries a citation, a cash award of Rs 123,456 and a handcrafted idol of Saraswati Devi crafted by noted artist Nambootiri. Upon receiving the award, the renowned poet said that he did not consider this recognition as a mere literary award, but as a blessing for his soul from one of the greatest humanitarian leaders of our times. “Now I have a great responsibility to uphold, and I assure you that I will do my best to live up to Amma’s expectations,” said Kurup. Honourable Minister of State for Home Affairs Sri. Prakash Jaiswal symbolically handed over certificates for 150 free fishing boats, engines and nets to fishermen who had lost their means of income in the tsunami. In his address, Sri. 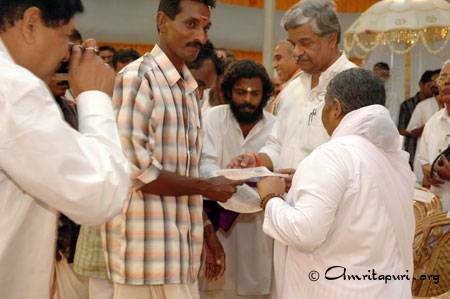 Prakash Jaiswal said he appreciated the wonderful charitable work done by the Ashram under the guidance of Amma. On behalf of the Governement, Smt. K. Gowri Amma received the keys for 16 tsunami-relief houses in Karunagappally Panchayat . Sri. 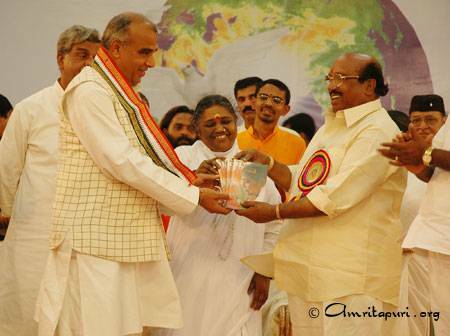 K. Divakaran launched the Mata Amritanandamayi Math’s Matru Gramam project. The aim of the project is to reduce the dependency of village folk on fishing by providing them with other means of livelihood. Along these lines, the Ashram is training villagers in trades such as tailoring, embroidery and chappal-making and then helping them to form self-help groups. Amma’s birthday function also saw the mass marriage of 52 impoverished couples. Amma herself solemnised these unions. 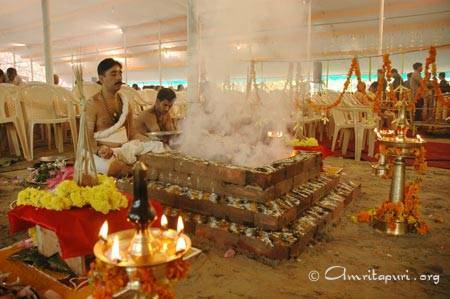 The Ashram provided the wedding saris and dhotis, gold ornaments and other traditional items; the total cost of which amounted to Rs. 45,000 per couple. Sri. Vellappalli Natesan, the General Secretary of the SNDP, also participated in the function, officially releasing a book by Amma’s disciple Swami Ramakrishnananda titled The Blessed Life. The first copy was received by Sri. Jagadambika Pal, the ex-Chief Minister of Uttar Pradesh. After the formal programme, Amma began giving darshan to one and all, and free food was distributed. 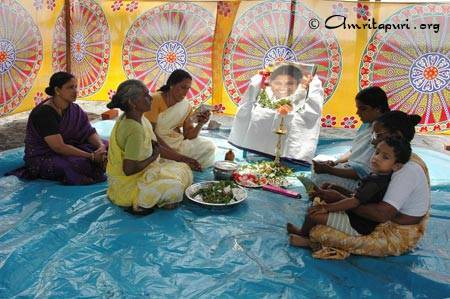 “Amma is very happy to see so many of her children gathered together here today. Children who have the attitude of service are the pride of their mother and the beauty of society. 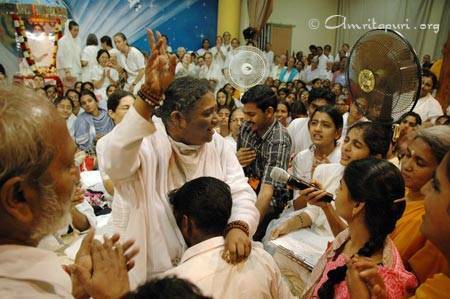 In Amma’s world, there is no such thing as birth or death. So for her how can there be a birthday? 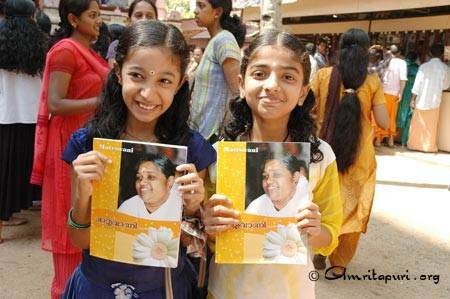 Amma sees this event simply as an opportunity to love and serve her children. Amma isn’t looking at the number of her children who have come together, but at the unity of their hearts”. 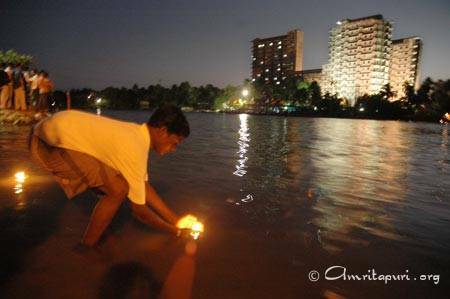 “When Amma looks back upon the last year, so many tragedies come to her mind: the countless lives and belongings that were destroyed by the tsunami, the recent hurricanes that effected parts of the United States, the floods in Mumbai, the terrorist attacks that took place in different parts of the world. 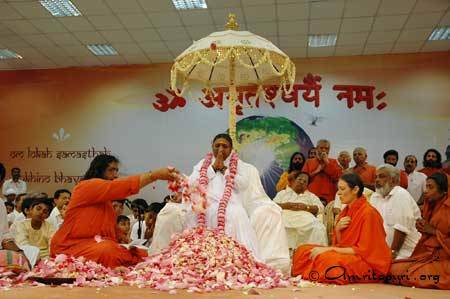 When Amma thinks about all these events, she feels that the whole world has fallen into the grip of an octopus of fear”. “When such difficult circumstances arise in life, there are two ways to respond. We can either run away in fear or kindle the love within and try to overcome them. If we choose the first option, all of our strength will be drained, and we will be blown about like dry leaves in the wind. It’s impossible to escape one’s own shadow. One who tries to run away from it will simply collapse due to exhaustion. 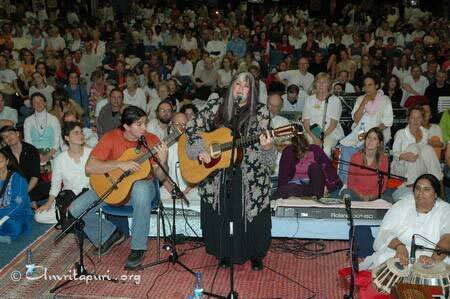 This shadow of fear will only disappear with the dawning of the light of love. Love is our strength. Love is our refuge”. “When such harrowing situations arise, we should try to use them to gather mental strength, so that we can grow, rise up and move to action. We have been given this human birth in order to face challenges and overcome them—not to run away from them. When a ship is in the sea, it has to weather storms, rough seas and may even encounter whales or sharks, while the ship anchored in the harbour doesn’t face any such challenges. However, who would make a ship just to moor it in the harbour? 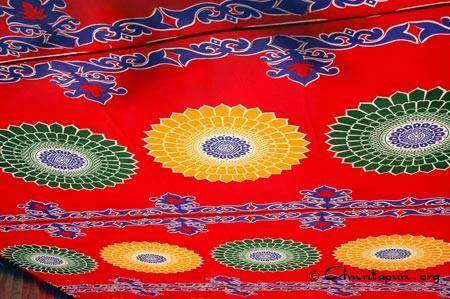 When obstacles appear in life, we need to kindle our inner strength and spread the fragrance of selflessness and love. We should be able to lift up others who are drowning in grief”. “Life may not always bring us good experiences. In fact, it may be that we have more bad experiences in store for us than good. Good and bad experiences are the nature of the world. However, we should learn to convert such challenging experiences into steppingstones towards success. For this we need a discriminating intellect rooted in the spiritual principles”. “When disasters take place, there is no point in blaming someone or the situation or Nature. We should try to go to the root cause. It is very easy to blame the government or a political party or even God. But we shouldn’t forget that we also played a role in creating the problem”. “For example, when Weil’s disease—or “rat fever”—breaks out in India , we typically blame the government. But if the people in each house keep their surroundings clean and regularly burn their waste, these epidemics can be avoided. Instead of pointing our finger at others, we should try to look to our own weaknesses. If we do so, we can avoid most problems in life altogether. Instead of using a magnifying glass to look at the faults of others, let us use a mirror to look at our own. Our efforts to remove hatred and indifference from the world should begin with trying to remove them from our own mind. If we can make our own mind clear and bright, the world will soon follow suit”. “If a nuclear war were to break out, we all know the amount of destruction that could come to pass. But right now there is a disaster taking place in the world that is much more destructive than any world war or tsunami or volcanic eruption—however, we are either unaware or are apathetic towards it. This is the decline of dharma [righteousness]. 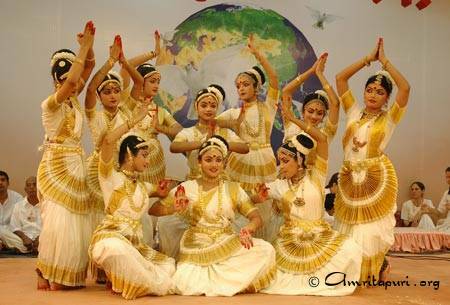 If we fail to restore dharma, all of our efforts to establish world peace will be in vain”. “Why are we not aware of this disaster? Because it is happening very gradually. If a pot falls down in our room while we are sleeping, we will definitely get up. However, someone who lives near the train tracks won’t even wake up when a train blows past him. If you put a frog in a pot boiling water, it will immediately jump out. But if you put a frog into tepid water and slowly heat it, the frog will not make any effort to escape. It will simply die. In the same way, we are not able to feel the heat of adharma [unrighteousness] that is steadily on the rise. In order for us to realize the seriousness of this situation, we need to imbibe the principles of dharma right from childhood . Only when our educational system starts imparting values along with academic knowledge will we begin nurturing individuals to have enthusiastic and awakened minds. Only then will society attain real success”. “Skill alone is not enough for success. In addition to skill, we also need proper understanding and knowledge of the task at hand. We also need patience. If we sow a seed and then regularly dig it up to see if it has germinated, it will never grow. Initially, there may seem to be no hope, but if we are patient and persevere, then in the end the flower of life will blossom”. “Due to our impatience, most of the time, we aren’t even aware of what we are doing or saying. Rather than feeling depressed about the opinions others may have about us, we should transcend our own limitations and try to do what we must with an optimistic attitude. Thus, patience, constant enthusiasm and firm determination to reach the goal are all necessary factors for success”. “We often consider our achievements to be the crowning moments of our life—for example, passing our college exams or receiving recognition in our field of expertise. Although these are significant, there are still greater accomplishments to be made in life. These are found in all the little things we do”. “Consoling a miserable soul, wiping the tears of a crying person, feeding the hungry, helping someone up who has fallen down—such seemingly trivial things are actually greater than mere worldly achievements”. “True service is the power that sustains the entire universe. When humanity serves Nature, Nature serves humanity. When we serve animals and plants, they too serve us in return. This attitude of mutual understanding and respect is what must be incorporated into society and into our family lives. Only when we serve others with the right understanding and with love and faith will we be happy and peaceful in life”. “When two lips come together, they emit one sound. Even though we have two eyes, our vision is one. Even when there are two lamps, light is one. Similarly, even though a husband and wife are two, they should live as one. The unity of hearts is the beauty of their house and the stability and foundation of the entire family. As neither the wife nor the husband has realized their completeness, their marriage should be a relationship wherein each partner compensates for the other’s shortcomings—not one where they point them out and blame each other. Where there is true love, the attitude of sacrifice will automatically be there. 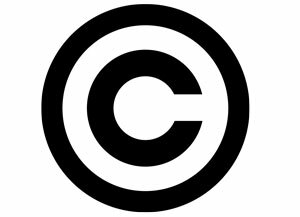 True sacrifice is relinquishing one’s likes and dislikes for another person. This should be the spirit behind each marriage”. Ramya, the daughter of Ravindran and Rajila of Medayil House in Azhikkal, was beaming with joy. 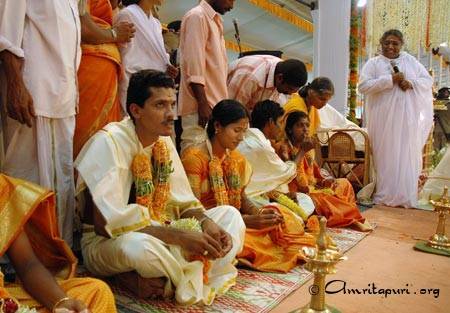 She is one of 51 women who will be married in the Ashram’s mass marriage taking place tomorrow on Amma’s birthday. Only a few months back, Ramya’s mother was heartbroken and distraught. There house had been ravaged by the tsunami, leaving her only with an ailing husband and two vulnerable children. In her distress, Rajila turned to Amma for assistance in getting her daughter married. 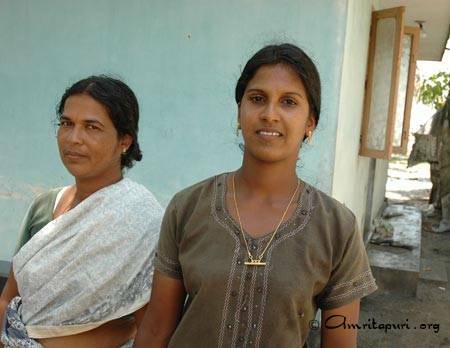 Ramya will marry Thambil Vallial, a fisherman based in Trivandrum , alongside 50 other couples. The Ashram is paying for the expenses for all the couples, including their gold ornaments, wedding dresses and a family feast–at cost of Rs. 45,000 per couple. “We will remember Amma’s special love forever,” said Rajila and Ramya. Tears of joy rolled down the cheeks of Ravi and his wife Ammini Amma, as they stood in front of the new house that Amma’s Ashram had built from them. This is in Azhikkal, where the tsunami devoured 86 lives, including two of Ravi and Ammini Amma’s grandchildren. Standing before her new home, Ammini Amma recalled how the events unfolded after the disaster took place last December. “Amma sent medicine and doctors to the sick and injured. Serious cases were referred to AIMS [the Ashram’s super-specialty hospital in Ernakulam]. This was followed up with pension for ladies,” Ammini Amma said. 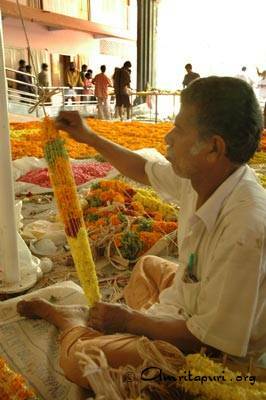 On 27 September, the Ashram will distribute keys to 550 houses to families who lost their homes in the tsunami. Another couple from Alappad Panchayat who will be receiving a free tsunami-relief house from the Ashram is Baby and his wife, whose house is adjacent to the entrance of the Amritapuri Ashram. After recounting the gruesome event and Amma’s healing touch thereafter, Baby says, “It is impossible to conceive that any organisation would do as much as Amma has done for us. I don’t have words to express the gratitude that our family has for the benevolence of Amma during these trying times.” Baby added that, as he lost his brother in the tsunami and his wife injured her leg–which has yet to completely heal—the experience would have been unbearable, but for the phenomenal efforts of the Ashram. Echoing similar sentiments was Sudhi, another recipient of one of the Ashram’s tsunami-relief houses. She said that only Amma’s Ashram was willing to put in the necessary effort for the necessary duration of time to build homes and lend a permanent helping hand to the people in distress.